You want to see some of the coolest sights in the Hudson Valley and you’re not afraid to crawl under (and around, and through, and over) some rocks to see ‘em. Weather warning: If you’re visiting in early spring or late fall, there’s a decent chance that the Labyrinth and Lemon Squeeze will be closed (it’s closed all winter). Before wasting your time driving there, you can call Mohonk for a recorded message on hiking conditions at 845-256-2197 (this number turns into their ski condition report in the winter). 5-alarm cheapskate alert! As of 2014, this hike costs twenty-one dollars PER HIKER on weekdays, and twenty-six dollars PER HIKER on weekends (current rates listed here). Totally worth it, but you might want to stop by the bank on your way here to hit the ATM. Or take out a second mortgage. Pooch proclivity: No doggies allowed. Which is just as well, unless your dog can climb ladders. Background you can feel free to skip: The hike across the Mohonk Mountain House grounds to the Labyrinth rock scramble and up through the Lemon Squeeze crevice is one of the most memorable outdoor experiences in the Hudson Valley, or anywhere else. Then you can turn around and find the Sky Top Tower right behind you, begging to be climbed. From up there, you can pretty much see the whole world. For all that you get to see and experience on this hike, the entrance fee really isn’t that steep. Okay, it’s pretty steep. Much like how Cookie Monster says that cookies are a sometimes food, the entrance fee makes this one a sometimes hike. But really, without the fee, this place would be an insane mob scene. Already, the parking lot is often full on weekends (be prepared to be turned away on a nice weekend day if you don’t get there early or pretty late in the afternoon). If this hike was free, you’d probably have to sleep outside the guard shack to get a parking spot. If you can swing it, I recommend hitting this hike at an off time – ideally, a weekday – to avoid the crowds. Besides the five bones (per hiker!) you’ll save, you’ll greatly reduce your chances of having to tailgate someone (or be tailgated) through the Labyrinth rock scramble. It’s slow going through the Labyrinth, and much more fun when you can relax and go at your own pace. I’ve been here when it’s very crowded, and there was a long line at the base of the Lemon Squeeze. We had to stand around for quite a while before we got to try it out. For my thirty-fifth birthday, we burned a half-day of vacation to come and do the Lemon Squeeze on a chilly October Friday, and we had the place to ourselves. Much nicer that way. Whenever you can get here, though, just be sure that you do. The best things in life are free. But sometimes, the best hikes aren’t. 1. From the day hiker parking area near the guard house, face the bathroom building. The trail goes behind the bathroom, heading to your right – you can hop on it by going behind the bathroom on its left, or you can pick the trail up further to the right, in the back corner of the parking lot. Feel free to go potty first. We’ll wait. 2. You won’t see any trail signs indicating it (at least I didn’t), but if you’re looking at the free (well, kinda free) map they gave you at the guard shack, you’ll see that you’re meandering down Huguenot Trail (from the parking lot on the far-right side of the page). Just keep heading straight, and in less than ten minutes, Huguenot Trail dead-ends into Whitney Road, where you’ll listen to the big red sign that tells you to stay off the paved road (which, for bonus confusion, is called Huguenot Drive). Keep heading straight on Whitney Road, with the paved Huguenot Drive running parallel on your left. 3. Whitney Road descends through the woods and, in less then ten minutes, comes to a rather unmarked intersection (there was a trash can there on my last visit, if that counts as a marker). Take a left here to continue along the (unmarked, as far as I could tell) North Lookout Road. This is the beginning of our loop – we’ll come back to this intersection later today via the little trail straight ahead (marked with a dotted line on the map, for those following along). 4. In less than five minutes, arrive at Beech Bend (unmarked on the map), where we’ll be ditching most of the other day hikers, who are heading towards the Picnic Lodge (we’ll swing past the Picnic Lodge on our way out at the end of the day, after we’ve earned a picnic). Take a left to hop on Glen Anna Path. NOTE: This way is a little more strenuous than the route to the Picnic Lodge. It’s shorter as the crow flies, but it also climbs 300 feet and then descends 150. I like this way because it’s the path less traveled, it creates a nice loop for the day and it takes you past a cool gazebo (Talman Seat) with a great view that you’d miss otherwise. If you’re not feeling ambitious, and don’t care about making a loop out of this hike, you can follow all the other hikers to the Picnic Lodge and then to the Mountain House. If you decide to bail on Glen Anna Path, happy strolling, and we’ll meet you at the Mountain House on Step 12 below. 5. Follow Glen Anna Path for about five minutes. It will climb a wooden staircase and dead-end on the far side of Huguenot Drive. Careful crossing the street! After crossing the road, go straight/left to hop on Fox Path. “CAUTION ROUGH PATH,” the sign warns. Good thing you eat rough paths for breakfast. 6. In the next quarter-mile, you’ll climb 215 feet. You might notice an occasional red trail marker painted on the rocks, but otherwise, just keep huffing up the well-worn path until it dumps you out onto Sky Top Road. 7. When you emerge onto Sky Top Road (it’s a wide carriage path), turn right to visit the nice gazebo with obstructed views. The shortest way to the Mountain House is to continue straight on Fox Path, but then you’d miss Talman Seat, which is a really cool spot, and it’s an easy amble to get there from here, perhaps adding a couple of minutes to your day. Relax at the gazebo for a minute, take a deep breath and contemplate how annoying it is that we’re not taking the shortest path. When you’re done contemplating, keep heading along Sky Top Road in the same direction, away from Fox Path. In a few minutes, you’ll pass another gazebo with nicer views on your right. 8. You’re only on Sky Top Road for .4 miles total (it took us about 10 minutes) before it dead-ends into Huguenot Drive (which has transformed into a walking path since the last time we saw it). Take a left onto Huguenot Drive, toward the Mohonk House. 9. In just a minute, there it is, on your right – Talman Seat, your first real view of the day. Not a bad place to stop and soak in the view for moment. On many hikes, this would be the grand finale, but here, it’s only – I want to say appetizer, but to continue the firework metaphor, I have to say that it’s actually a sparkler that a little kid is waving around before the fireworks even start. Or maybe a glow necklace? You get the idea. 10. When you’re done, hop down from Talman Seat and continue along Huguenot Drive. In just a minute, you’ll be looking over the Mohonk Mountain House and grounds. Impressive, right? That’s where we’re headed. 12. As you approach the Mountain House, you’ll pass a putting green on your right, and then, boom, there it is, right in your face. Mohonk Mountain House. Note: The great unwashed day-hiking rabble (that’s you) is not allowed into the Mountain House, or even on the porch. If you brought a pastel sweater to tie around your neck, you could try to blend in with the paying customers, but your Nalgene bottle might give you away. But seriously, they can’t have the Mountain House packed with tons of people all the time, and the folks who shelled out many hundreds of bones per night deserve some elbow room. Besides, the truly awesome stuff here is not to be found indoors. Walk right up until you’re overlooking Mohonk Lake, with the Mountain House looming above to your right. 13. The real adventure is just about to begin! As you approach the lake, you’ll see signs directing you to the Labyrinth. Start heading around the lake to your left, away from the Mountain House. Take a right at the fork to join Lake Shore Road, which will bring us to the Labyrinth in just a minute. 14. Take a gander back at the Mountain House. What a cool place. And then, just a minute after you joined Lake Shore Road, your date with destiny begins, on a little side path on your left. There’s a nice sign posted at the Labyrinth entrance with lots of warnings about what you’re about to do. Those warnings are not being alarmist – please take them seriously and don’t attempt this ascent if you’re not looking for an adventure. You can always bail out now and stroll on the paved Sky Top Path up to Sky Top Tower instead (just go back towards the Mountain House and make a U-turn where you turned onto Lake Shore Drive). 14. Still with us? Excellent. Welcome to the Labyrinth! Sorry if you were expecting David Bowie to be here. That’s a different Labyrinth. Let’s do this thing. Just keep following the red markers through the Labyrinth – and make sure to keep a sharp eye out for them. There are a couple of spots where you could lose the trail if you weren’t paying attention. Just keep following those markers, enjoying the twists and turns. Seriously, that’s where the trail goes? Yeah, that’s where it goes. 15. It took us about 40 minutes to navigate the Labyrinth. What an awesome place. When you emerge, the trail opens up, the red trail markers direct you towards the crevice and you can finally stand up straight for a little while. 16. Enjoy a quiet woods stroll for about two minutes. Ahhhh, what a nice, relaxing – okay, that’s over, time for some more rock scrambling! 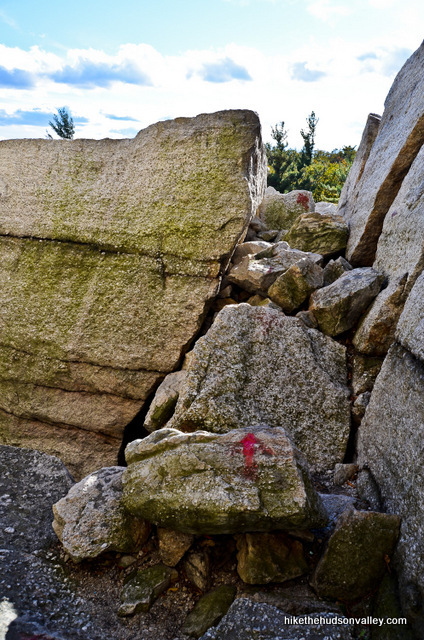 Watch your step as you continue following the red markers, hopping from boulder to boulder. It’s easy to get distracted by the widening views and beautiful cliff towering above you. 17. After a while, you realize that the trail is taking you toward that crack in the cliff. Seriously? Seriously. Keep heading toward that crack until you arrive at the ladders. Going up! 18. Climb those ladders and get squeezed, lemon! Hope you don’t mind heights too much. For the final ladder climb, if you’re wearing a backpack, it’ll be helpful if you have someone higher up who can grab it for you. Otherwise, you’ll have to push it up over your head or find some other creative way to get it up there. It’s a tight squeeze. The toughest spot is at the very top, where there’s often a bottleneck on crowded days. Take your time and figure out how to wriggle up those last few feet. 19. Congratulations, you made it! Whoa, dude — who knew this awesome view would be waiting for you at the top? 20. After soaking in the view, cross the little footbridge that spans the crevice you just climbed. Hello down there! 21. Follow the trail up one last rocky patch, then up a flight of stairs toward the Sky Top Tower. Note the signs on the stairs that tell you not to come back this way. It’s a one-way labyrinth. 22. Pick your way up to the Sky Top Tower, then go inside and climb the stone steps all the way up. If you live in the Hudson Valley, there’s a pretty good chance you can see your house from up here. If you know how to yodel, let it rip. Otherwise, just relax and enjoy the 360-degree view. It’s all downhill from here. 23. When you leave the tower, take a right turn out of the door to walk on the gravel Sky Top Road, towards the Mountain House. 24. About one minute after leaving the tower, you’ll take a left turn off the gravel road onto Sky Top Path, towards the Mountain House. 25. Follow Sky Top Path all way back down to the Mountain House, passing several nice gazebos and an ice skating pavilion on the way. It took us less than fifteen minutes to get back down. A little quicker than the way up, right? 26. Just before you get back to the Mountain House, you’ll start seeing signs directing walkers (that’s you) toward the Picnic Lodge. The Picnic Lodge is our next destination, so follow those signs. 27. Stroll across the wide-open lawn to the right of the Mountain House. The best landmark is the big stone gazebo, marked as “STONE SUMMERHOUSE” on your map. As you walk toward the Stone Summerhouse, you’ll want to veer left and downhill, heading toward Greenhouse Road. 28. Downhill from the Stone Summerhouse, hop on Greenhouse Road and keep heading away from the Mountain House. In a couple minutes, you’ll pass the greenhouse on your right. 29. Follow signs toward the Picnic Lodge, which is right across the street from the greenhouse. Take the crosswalk across Barn Road, then veer right toward the Picnic Lodge. 30. Now that you’ve found the Picnic Lodge (this place was once Day Hiker Central, with food available for purchase, but it’s now closed to day hikers and used for pastel-sweater-type events), you’ll be following signs toward GATE. Go to the LEFT side of the Picnic Lodge. The road on the right side, which looks rather inviting, is a dead end. We found this out the hard way. Walk around the Picnic Lodge to the left to pick up the little unnamed path (marked with a red dotted line on the map) that will lead you to North Lookout Road. 31. When the unnamed path beside the Picnic Lodge dead-ends into North Lookout Road, turn right. North Lookout Road wraps around a small picturesque cliff, giving you your last up-close look at a Mohonk rock face for the day. Feel free to give it a hug. 32. Hey! More views, and a gazebo! Awesome. What a nice way to end the day. Whenever a sign gives you a choice, pick GATE or GATEHOUSE. Otherwise, just enjoy the stroll. You’ll walk about three-quarters of a mile before your next turn towards the Whitney Road shortcut – it took us about fifteen minutes to get there from the Picnic Lodge. 33. When you see a sign on your left that says “SHORTCUT TO WHITNEY ROAD AND GATEHOUSE,” turn left to head down the stairs and take the shortcut. 34. Follow the little shortcut trail for just a minute, then it pops you back onto a familiar intersection from earlier in the day. Stay straight to hop on Whitney Road and close the loop for the day. You’re now retracing your steps back to the car. 35. In about five minutes, you’ll bear left at the intersection to get back on Huguenot Trail, following the sign toward GATEHOUSE and PARKING LOT. There’s a really good chance you don’t need this trail guide anymore, but we’ve come this far, so let’s just wrap this up together, shall we? 36. Five more minutes and boom! There’s the parking lot. We did it! Okay, you did all the hard work. But still, what a day. I hope you feel much less ripped-off than you did after arriving here earlier today. It was worth the entrance fee, right? Indeed. Now, time to go retroactively carbo-load! I recommend the Cajun chicken nachos and clam chowder at P&G’s in New Paltz. Perhaps, in honor of your accomplishments today, you should order some lemonade. From a fresh-squeezed lemon, like you. From the village of New Paltz, head west on Route 299. Just past the bridge over the Wallkill River, turn right on County Rd 7 (Springtown Road), towards the Mohonk Mountain House. In half a mile, veer left onto County Rd 6 (Mountain Rest Road). Follow this road up the hill, then turn left into the Mohonk Mountain House entrance (if you go under a little overpass, you’ve gone just a hair too far). Stop at the gate house, where you’ll receive a map and be relieved of your money. You can also get directions by checking out the Mohonk Mountain House: Labyrinth and Lemon Squeeze entry on the HiketheHudsonValley.com Google map. Thank you for this thorough guide. How long is this entire hike start to finish? Hi, Chelsea! The hike documented above is a 5.5-mile loop. For all the hikes documented on this site, you can find the hike’s key stats in the sidebar (on desktop) or right at the top of the page, just under the banner image (on mobile). Happy adventuring! I was wondering if this trail would be open for this upcoming Sunday, March 31st, 2019… Or is it still a bit too early? Hi Amanda! In previous years, it’s been May or so before it opens. Not sure what the situation will be this year, but the snow/ice tends to sit in those crevices much later than it does everywhere else. I suspect March 31 will still be too early. If anyone hears otherwise, please let us know and I can post an update! Hello. Anyone know if this is doable right now (3-5-19)? Is the trail/scramble too covered with snow? Hi Michael! It will still be closed for the winter now, and probably for many more weeks, too. You can still stroll the grounds and take regular trails up to the tower, but the Labyrinth and Lemon Squeeze do not open until it’s been warm for quite a while. I like that we’re close enough to spring that you’re asking the question, though! Excellent guide! Went there yesterday and it was gorgeous. Super useful guide so thank you again. The choice to take good path in step 5 is excellent. Thanks so much, Sarah — really nice to hear some independent validation on that choice in Step 5, too. Much appreciated! Is there camping nearby? I’m very interested in this hike but will have to travel for it. Also – I plugged in the address you gave for the Mohonk Gate House, and directions to “Lemon Squeezer / AT” – and google said it was a 50 minute drive. Is that a different lemon squeeze / labyrinth than the one you describe here? Hi, Sarah! This campground is pretty close: https://americanalpineclub.org/gunks-campground/. Never been there, but it’s new and looks nice. And I’m glad you checked on the directions! Yes indeed, “Lemon Squeezer / AT” is a different place entirely, in Harriman State Park, perhaps an hour from this hike. You can click the GPS coordinates in the “Directions to the trailhead” section above to point you to the right place here, or punch in the street address for the Mohonk Mountain House (1000 Mountain Rest Road, New Paltz). Hope that helps – happy adventuring! Thank you!!!! it absolutely helps 🙂 Appreciate you taking the time to provide the info! Is there any way to this same hike you posted but not pay a fee? It doesn’t matter if it’s more miles. Just somewhere where we can park somewhere else and still hike to that start of the trail head and still hike this. I really do not want to make any $ for just a hike. So ridiculous that they charge you $15 or $26 per person. I’ve never paid for a hike and will never. It’s nature. Really excellent hike – enjoyed it very much – superb scenery. One comment – for the money payed – they could have done a better job with the map they hand out!!! This hike was amazing! So many awesome lookout points. We went with my 4 year old and 7 year old, and because of that we didn’t go for the lemon squeezer 🙂 but instead did the regular hike to the tower. It was a bit tiring for my 4 year old, but we made it all the way from the parking lot to the tower and back, and loved the adventure. Took us about 4.5 hours due to several long-ish stops to take a break. Thanks for a superb write-up! Jocelyn, your four-year-old sounds like quite the adventurer! (Much respect to the seven-year-old, too) 🙂 Glad you all had a great time out there. Thanks for the report and the kind words! Hi Richie! The rates listed on the Mohonk site still show $26 per hiker on weekends, $21 per hiker on weekdays. If someone can confirm that the rates have changed, please let me know so that I can update the Cheapskate Alert above. Thanks! Mike, still $26 per hiker as of 9/16/18. Well worth it for all you get to see in just a few hours. Well-marked and well-maintained trails, gardens, gazebos galore, ginormous one-of-a-kind hotel with a gorgeous lake, rock scrambling, crevice exploration, killer panoramic views, and a unique stone tower! Mohonk is a must-see destination for everyone. Is it crowded this time of year? Thinking of going this weekend. Hi Ariel — it shouldn’t be too crowded for hiking on the grounds, but the Labyrinth and Lemon Squeezer will almost certainly be closed for the season after yesterday’s snow. Enjoy the trip if you decide to make it! I went to college at SUNY New Paltz from 1991 to 1995 and this was a weekly hike. Back then the lemon squeeze has a simple long piece of wood with short piece for steps not really ladder. you had go wedge yourself up really. the labrynth or as we called it rock scrambling was fun as we have races across it. do people still walk to to the top of the light house? I am not too fond of heights, How bad is the labyrinth? from the pictures it doesn’t appear to have many crazy ledges to deal with? are the ladders just to help you get over rocks? what is the longest ladder I will face? going the second weekend in November, hoping it will be open. Again, thanks to the awesome info on this site. Hi! Update Fall 2016: As of very recently, Glen Anna path from Beech Bend to the auto road (steps 4 and 5 above) has been made more accessible, more like a carriage road. It’s still steep, but it’s wide and smoothly graveled. The stairs are gone, replaced by a gravel-and-rock paved switchback. So the photos in steps 4 and 5 are now out of date. Just wanted to say thank you for his incredibly-detailed article. I first stumbled on this page a couple months ago and knew immediately that I needed to put this place on my bucket list. Now – months later – I’ve finally scheduled the time and gathered a large group of friends to go hiking there this weekend! We’re all very excited. Thanks so much again! Thanks for this wonderfully detailed article! I will probably be going this weekend with a few friends. I am so excited for it! Ahh! I am feeling the rush just thinking about it, or maybe its from the coffee I just drank, but I am feeling something! When we were at the visitor’s center for the Mohonk Preserve the ranger told us that you can do the lemon squeeze from off of the preserve and thus save some money (day rate is $12). Hi Jared! That’s right – see the “5-alarm cheapskate alert” above for a pointer on how to do that. Thanks for sharing the tip – please let me know if the ranger recommended something different than what’s written above. Thank you! You. Are. Hilarious. Looking forward to trying this hike the weekend of July 8th. I’m hoping it’s not too crowded. About what time do we need to get there in the morning to beat the crowds? I’m planning to go this weekend. how long does the entire thing take. i’ll be following the directions provided above? Hi Nicole — You can find an “Approximate roundtrip time” at the top of this guide — I pegged it at four hours, but your mileage may vary. Have fun! We did this hike on Saturday, October 24, 2015. These directions were perfect! Almost too detailed as the trails are marked near perfectly now. Parking: We got there at 8:30am and had no trouble. It was completely full and they were turning people away as of 12:30pm when we left. Labyrinth/Lemon Squeeze – This part doesn’t actually start until you are next/behind to the Mohonk Mountain house. You get to it from the bottom most trail. The entrance is on your left with the warning sign. It is NO JOKE! The warnings you see are real. I am very fit and I struggled on lifting myself on some parts. Also – You will not fit through some spaces with a backpack. Either bring a small one or you will have to take it off, remove it and push it through. There were no lines for the tight parts but I could see it getting very crowded/long waits as more people came by. Views – Absolutely unbelievable. Especially as you emerge from the last squeeze and rest on top of the rocks. You can get to this area without going through the craziness though. Just take the carriage road to the tower and take the stairs down to the rocks. (Opposite side of the carriage road) Simple as that. Thanks for the awesome write-up! I printed out your directions and my boyfriend and I hiked on October 10th amid all the crowds. The wait for the lemon squeeze was about 1/2 hour….we were expecting a little wait, but some woman had a panic attic trying to make it out of the last little bit. Once she managed to move, the line went much faster. Appreciate such detailed directions, we loved every second! Thanks so much, Kyle! Sounds like you had a much better time than the woman with the (you know, understandable) panic attack. Glad you guys had a great trip. to stop me from sliding into areas you don’t want to go into, but it all was worth it! The views were crazy beautiful, the people were all very nice as most climbers are and we were glad we made the trip from Long Island! Well worth it for the adventure we had! GO GET THAT!!! Hiked it last weekend – if you haven’t, you’ll never forget it – true Indiana Jones stuff. When we finished the walk from the parking lot and arrived at the lake infront of the lodge I wondered where the trail began – then my friend pointed at a ‘crack’ in the sheer rockface on my left – if suggested I was about to walk into the rock wall ala Lord Of The Rings (the third movie when they walk off into a narrow break in the cliff to summon the ghost army) – i immediately acknowledged this was no ordinary trail. We slipped into the crevice and found ourselves shimmying and squatting and climbing and sliding – sometimes having to remove our day packs and pushing them infront of us through little tunnels and crags because they were so close quarters and I could fit wearing the pack. And, as had been said by the others, the end of this trail up the mountain was a thrilling finale – the sort of experience that ignites a small mental challenge, a safe, welcome adventurous dose of fear – it leaves you wondering if you can do this – but, of course, you can – its just a tight squeeze, not a lethal cliff or something along those lines – and I saw a 250 lb hulk make it through, so no need to be a waif – bigger than that, maybe don’t try the trail. When you emerge at the top of the lemon squeeze hikers sitting above you, gazing at the gunks a few miles in the distance, smile knowingly towards you – some even offer a sympathetic and slightly unnerved ‘well done’. You now have something in common with them. It’s not a cardio hike, it’s a technical hike because of all the scrambling and crawling and climbing. You’ll take most of it slowly making certain where you’re putting your hands and feet, looking for proper holds. But it’s not particularly dangerous – I don’t want to leave that impressing – its just pure adventure – with a sprinkle of something at the end that forces you to overcome a bit of an unnerving squeeze as you ascend and emerge from the rocks at the end. You won’t forget it, and you’ll be grateful Mike wrote it up for you to try. Driving back to CT now after a great hike at Mohonk, thanks to you! We kept your article open as we hiked and really enjoyed the route. For two pretty fit twenty something’s, we made it back in 3 hours and some change. Next time we’ll definitely take on the cheapskate route to burn a few extra cals and save some coin. We even made our way to P&Gs, but the food was pretty inedible, sticking to just drinks next time. Cheers! Did this one today for my 60th birthday! Be in shape! This was a superior write-up–keep up the good work! Did this hike yesterday and loved it! The crevice climb at the end was amazing. The tower is closed for construction (it’s covered in scaffolding), but the views around it are still worth the climb. One small note — the intersection in Step 3 now has a clear sign labeling North Lookout Road (in addition to the trash can). I was wondering does this the hike get really crowded around labor day weekend? I want to invite my friends to come but they’re really scared of the crowd. I’ve never been up there on Labor Day weekend, but I would expect it to be a zoo. If you get there early (or late?) enough, might still be a winner, though — good luck if you give it a shot! Tom, I called Mohonk today to get an answer on this one, just in case other folks would be interested in the answer. I was surprised to learn that day hikers ARE allowed to rent canoes (current rate in 2014: 15 bones for 30 minutes), depending on availability. Overnight guests are given priority. Day hikers are NOT allowed access to the swimming beach. However, if you have an “accident” in your canoe, and someone happens to go overboard somewhere else in the lake, and this person decides to make the most of the mishap by taking their time getting back into the boat, apparently this sort of thing can happen from time to time without anyone getting booted off the premises. Hope that helps! do you need to reserve for a group? Hi Maggie — I’ve never been there with a group, so I’m not entirely sure. You should probably give the Mountain House a call to be safe: http://www.mohonk.com/contact. Hope you have a great day out there! That was the best blog, description, review, directional, informational, article I’ve ever read in the history of blog, description, review, directional, informational, articles. And funny on top of that. I’ve been to “The Squeeze” before, and if their maps are as they were last I visited……..well, let’s just say I’m printing your article out, just in case. Thank you for such a detailed trail guide. Really helped us out. Had a lot of fun, a great hike! Thanks Mike! Was thinking to try this with a 10 month old in a back carrier – obviously, I would miss the lemon squeeze portion…but is there still a less cattle-herd hike available with baby in-tow…or should I spring for the babysitter AND the admission price? A fellow child-lugger! You could absolutely make a great day out of hiking with your 10-month-old here, but you’d have to skip everything from Step 15-21 above, opting instead to walk the regular path up to Skytop Tower, which is clearly marked and easy to follow. I don’t like to say things are impossible, but doing any part of the Labyrinth or Lemon Squeeze with a baby on your back would be pretty well impossible. You’d still have an awesome day here with a ton of great views and sights to take in, though, even skipping the scrambling part. Hope you and your little one have a great adventure here if you give it a go! Just called today for trip next week. Price is $21 midweek, $26 weekend. But we needed that extra dollar to play Powerball so we could afford to keep hiking here! Ha, no, still worth it, but this is definitely a sometimes treat. Thanks for the update, Jen. I just updated the trail guide accordingly. Great writeup, thanks! Pictures don’t do it justice. A few things I was thinking while doing this: 1) I wonder what the trail designer was thinking (hmm, I think putting a three story ladder up a crevice is a great idea), and 2) wish I hadn’t worn a backpack. Also FYI, the breakfast is $45 all inclusive (tax and tip) and you pay up front, at the time of reservation. Still very worthwhile to shave a few miles off the hike and have an all-you-can-eat buffet. We did this trail today! It was awesome. We are so glad we looked at your guide because otherwise, we would probably have turned back about 5 minutes into the labyrinth. They should warn you that carrying bottles of water by hand doesn’t work. Both hands required! We purchased breakfast and so for a few bucks more per person, we were able to explore the house and property. It’s worth considering because it allows you to spend a whole day hiking the grounds with a few breaks here and there. Plus, cookies and tea in the afternoon! Dudes, that sounds like a very high-class way to do it, and I’m glad you were able to put down the mimosas long enough to get in some hiking! Thanks for offering that suggestion here — my guess is that other people will want to try that option, too. I just looked it up — it’s really only twelve bucks more per person (plus tax and tip), and it also shaves some miles off the hike, since you can park closer to the Mountain House. Very nice idea — I’m slow-clapping at you right now for coming up with this plan. Thanks so much for taking the time to give such a detailed write-up! Super informative and sold me on going after being hesitant for awhile! Thank you, Tom – really glad to hear that this write-up was useful. Hope you have a great time out there! Hey great description! I am going to give the “cheap” way a go because im going to be with 4-5 people all of which are experienced hikers in great shape but also poor college kids haha. Also we are looking for a longer hike, I was wondering if you had any advice for us? Thinking of hitting the trail next weekend weather permitting. Also is there somewhere to pick up a map or better to print one out or search my archive of maps of the area? This was a fabulously helpful and informative write up. Thank you so much for taking the time to do this. My friend and I are going to Mohonk next week and are considering the Lemon Squeeze. I am a little freaked out by tight spaces, though if there are ladders for each bit of the crevice climbing I guess I’ll be okay. Is there any rock climbing in the tight spaces without ladders? Thanks! Thanks so much, Nicole! Really glad to hear you’ve gotten some use out of the site. No, there’s nothing crazy that you’ll be expected to do without a ladder. There are a couple spots that will give you pause as you figure out the best way up, but you’ll be fine. You will want to call that number I listed above before you go — 845-256-2197 — to get a recorded message about the hiking conditions. I’d be really surprised if the Labryrinth was open yet. The snow and ice take a long time to melt down in those nooks and crannies. Either way, I hope you have a great trip to Mohonk, and thanks again for the kind words! GOD SAVE THE QUEEN!! this hike looks amazing. Very nice write up Mike and photos of you and that hot girl are very well done. I’d like to go on this one for sure one day. Great post, keep them coming. Thanks, Rob! Yes, absolutely, you’re on, let’s hit it up. If you actually come visit from LA, I’ll pay the entrance fee for both of us, which would cost about the same as your plane ticket.